racism | Godaganda: daily meditations on the Sovereign God Agenda. Godaganda: daily meditations on the Sovereign God Agenda. Systematically releasing the "God" agenda. The Pulpit, Hoodies, and the Gospel: When zeal for the House of “black” outweighs zeal for the House of the Lord. When I read Jesse Jackson’s quote from a sermon on a recent Sunday, my heart began to burn. 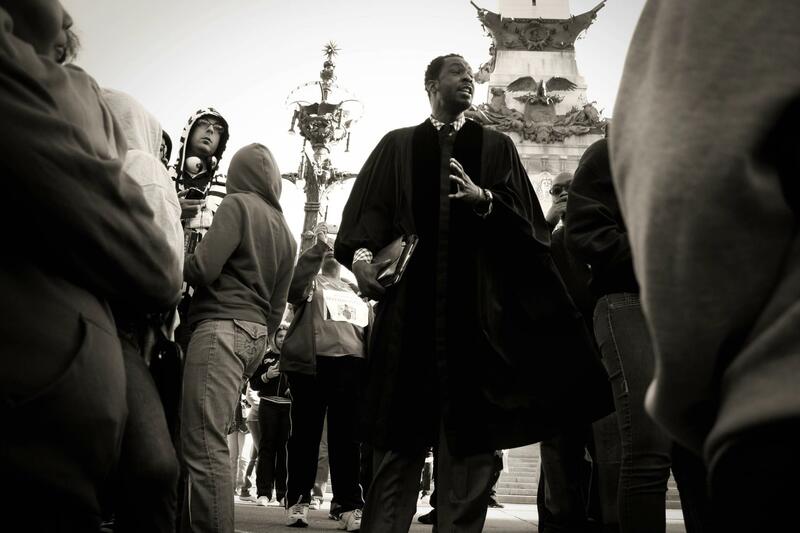 The next day, I attended a march in downtown Indianapolis where over 2500 people showed up seeking “Justice for Trayvon”. As I hurried out the door, the Lord instructed me to put on my preacher’s robe because He had something for me to say. I quickly wrangled my black robe (which previously I have only worn once to officiate a wedding) out of it’s bag and made my way to the rally. Within minutes of my arrival, I stood on a hill far away from the crowd and surveyed the landscape, taking in an image that mimicked the photos that so many of us have seen from the Civil Rights Movement Era. Then something surprising happened. A young pastor who I recognized, emerged from the crowd with a megaphone and began to run towards me. Within seconds, a throng of the crowd began to follow suit and within 5 minutes the whole crowd was standing below the hill looking up at where I was standing. To my right was this young pastor, to my left was an older pastor, and behind me was an Imam from the Nation of Islam and his whole security crew dressed in slick suits and red bow ties. I don’t know how it happened, I wasn’t an organizer or even a part of the event. Maybe it was the robe, but suddenly, where I was standing became the pulpit. Since the days of slavery, the pulpit has been the ultimate place of leadership in the black community. Rooted in the reality that only Christ could set us free, our ancestors looked to the infallible and Eternal Word of God for rescue and not the temporal solutions of men. Most of all, our forefathers who endured grueling beatings from slave masters knew that even if they did not see justice in their lifetimes, there was One whose back was ripped open to purchase justice on their behalf and who would one day vindicate them: Jesus. This knowledge was sufficient to keep them in perfect peace and give them and their children strength for the generations to come. When I read the words of Mr. Jackson who went on to call Trayvon a martyr, I was stirred with Godly frustration over the fact that Jesus the martyred and RISEN redeemer, was not welcome in the conversation. Interestingly enough, He also wasn’t invited to the rally in Indianapolis. As these leaders stood and passed the megaphone, the crowd chanted with great fervor: NO JUSTICE, NO PEACE! Ministers of the “gospel” next to me delighted in stirring the crowd. It seemed as if it was almost a competition to see who could say the words that would provoke the crowd the most; recounting the years of injustices, the defiance needed for change, and the need not to be oppressed. I was grieved as I watched the unholy spirit of the gospel of ethnocentrism, throw the crowd into convulsions of zealous response. I posted briefly on facebook about the Jackson sermon and posed the question, “Do you see what Gospel is being preached?” A friend responded that no one was taking away from the power of the blood of Jesus but rather highlighting the powerful actions that can come from the bloodshed of those who have died. However, the very lack of mentioning THAT BLOOD, the blood that was shed for not just black people, but that liberated ALL of HUMANITY from slavery and the fallen systems of this world at the very moment where people need to be reminded of where TRUE hope and TRUE justice prevails..is an AFFRONT to heaven. The blood of Emmett Till and M.L.K. JR has changed public policy and created billions of opportunities for African Americans. However, our prison system is filled beyond capacity with black males, the family unit is in shambles, our graveyards are filled with hundreds of thousands of “Trayvon’s” (many of whom’s lives were taken at the hands of young men who look like them), and literally millions of other African American lives are being cut short by their own mother’s IN THE WOMB. Due to the blood of MLK and the hard work of countless others; billions of federal, state, local, and private dollars have been spent since his death to try and break the perpetual cycles that have become common place in every low income area in America. (I have a non-profit org in the inner-city so I personally have benefited from it.) However, the SAME problems not only continue exist but seem to be multiplying and morphing with each new generation.If the branches of all this “progress” produce the fruit of the statistics in this generation, what kind of seed did this tree come from? And racism? Oh yes, without question it still exists. Guys like Jackson and Sharpton have bounced from pulpits, newsrooms, and street corners for over 45 years calling for “JUSTICE” by articulating the real and perceived injustices of the African American experience; igniting emotions, and leading thousands to demonstrate time and again. While they have succeeded in being visible and vocal, their messages have not led to a HEALING of the HEART. Meanwhile, the substance in many pulpits has become an empty “black liberation theology” that brings a measure of social change through activism but is powerless to break the death grip of oppression that all racism/hatred is rooted in: SIN. Only the blood of Jesus can deal with that. Furthermore, this DIVINE INNOCENT BLOOD compels us not only to sympathize with Trayvon but to love, forgive, bless, and pray for our enemies (whoever we think they are..which in this case is Zimmerman). Rather than being so easily reactive when the media blows up a news event, the church should be modeling the character of Christ. What should set us apart is how we RESPOND rather than REACT in the face of being wronged.Proverbs 12:16 says, A fool’s anger is known at once, But a prudent man conceals dishonor. Instead, many of our churches are revealing their own lack of divine wisdom by allowing our pulpits to be used to fan the anger into flame and draw us into valuing our earthly identity over our heavenly citizenship. By default, due to the historicity of the relationship between the church and the black community, the rest of the culture follows suit. Any purveyor of biblical truth should know that racism, oppression, and injustice of any kind is not a political or cultural issue, but rather a spiritual issue. You can throw all the protests, policy, money, and time that you want at something but if it is not dealt with in the spiritual realm, it will only manifest in another form at a given time. But we haven’t been able to deal with it because the Church is the most segregated place on earth. How can we bind up and reconcile that which binds us and for which we need to be reconciled? If we who are supposed to be known by the world for our love, cannot genuinely “act JUSTLY and love mercy” (Micah 6:8) toward one another, why do we expect anything different from the fallible systems of this world? Maybe we’ve trusted in the blood of earthly Messiah’s so much when it comes to solving social justice issues that we have forgotten how the blood of THE Messiah applies? Unfortunately, when Obama was elected, a large portion of America fell under an illusion that we had crossed the river and entered into a new utopia of racial harmony and progress. However, Matthew 24:7 informs us that as we near the days of Jesus’ return, “nation will rise against nation.” Nation can be translated to “ethnos” or ethnic group. What this means is that we can actually expect to see racial tensions increase not just here in America but across the globe. In these days and the days to come, every believer black or white should be able to bring clarity in the midst of growing racial tensions because we understand the solution according to Ephesians 2:14- For He Himself is our peace, who made both groups into one and broke down the barrier of the dividing wall, by abolishing in His flesh the enmity, which is the Law of commandments contained in ordinances, so that in Himself He might make the two into one new man, thus establishing peace, and might reconcile them both in one body to God through the cross, by it having put to death the enmity. At the rally, the microphone finally made it into my hands. They told me I had 60 seconds to speak so I encouraged the crowd of many faiths that I was there to speak primarily to the Christians. I reminded them of Ephesians 4:26 which says to “Be Angry. But in your anger, do not sin. Don’t let the sun go down on your wrath (don’t hold on to your anger, but give it to God), lest the Devil get a foothold.” The crowd was silent. There were very few cheers. The mic passed and within moments, the pep rally continued. Later, the party moved to monument circle and the vow “NO JUSTICE, NO PEACE!” penetrated the air. That’s when I realized that the only microphone I needed was my vocal chords and that my pulpit would be every individual. So I walked through every portion of the crowd and shouted at the top of my lungs “JESUS IS OUR JUSTICE! JESUS IS OUR PEACE!” It caught people by surprise at first and I watched as many of their expressions changed from anger to silence. As if processing what I was saying and the implications of it, the words began to penetrate through the noise of the media and the leadership that we’ve become so accustomed to. I imagine that suddenly young people were getting flashbacks of their praying grandmothers whose first response in the face of mistreatment was singing a song of praise. I watched as older women began to say Amen and older men said, “Now you betta preach that!” I moved closer to the new pulpit area as those around me motioned for me to come closer and said, “Now YOU should be on that megaphone! They ain’t sayin nothin but you sayin something!” And I realized, this message is the only message that will sustain, preserve, protect, and lift us beyond any injustice, real or perceived.The Trayvon situation is merely the manifestation of humanity. Zimmerman is fallible. Trayvon was fallible. The police are fallible. The justice system is fallible. Our marches are fallible. Our policies are fallible. We are fallible. Therefore, we must preach about a blood that is infallible, a government that never fails, and a ruler whose reign is established on the foundations of Justice AND Righteousness. Our ancestors understood this in the midst of unimaginable oppression. We must REPENT and RETURN. Jesus is our Justice, Jesus is our Peace!